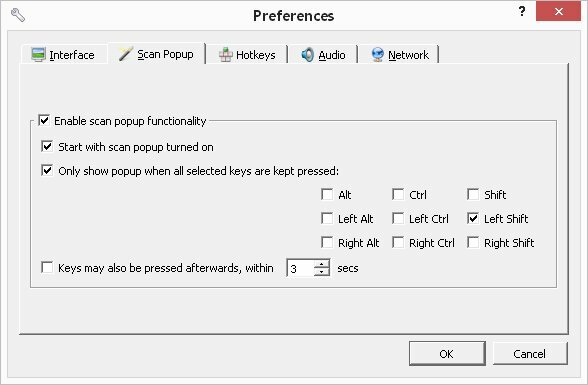 I read a bit about ScanPopup and I activated this in settings, but I have no idea how this should work, I guess it is not working on my machine. I think It should open GoldenDict automatically if I just hover a word on any other window of any app and if I press SHIFT, shouldnt it? No need to select anything, just hold the mouse over it and SHIFT-press (in my settings). Is it with OCR (like Babylon)? I think I didn't understand it or it doesn't work, somebody could clarify? At first take more fresh version here. franc wrote: I think It should open GoldenDict automatically if I just hover a word on any other window of any app and if I press SHIFT, shouldnt it? Did you turn on scanning via "magic wand" button in toolbar or tray icon context menu? If yes just press Shift and then move mouse over word. GD should show popup window with translation. But this feature works not in all applications. It will work in Internet Explorer for example if you turn on "Use IAccessibleEx" option on the "Advanced" tab in preferences. franc wrote: Is it with OCR (like Babylon)? Will it work in Word or Notepad? Where is it sure it would work without any special setting (like in IE)? Sorry, installed the actual 1.5 and WOW it works out of the box!! With e.g. EditPad Pro etc. Today I tested GoldenDict for Mac, version 1.5.0-RC-114-gbb8f14e from github. On my MacBook Pro (11/2009) with OS 10.10.3. I don't find any program where the activated Scan Popup is working. Neither GoldenDict itself nor Word, Openoffice, Finder, SimpleText, Mail, etc. Not working unfortunately neither not with different keys which has to be pressed, tried a lot of combinations, not working.